Spain’s two largest trade union federations, the Comisiones Obreras (CCOO, “Workers Commissions”) and the Unión General de Trabajadores (UGT, “General Union of Workers”), have announced they will support the general women’s strike slated for International Women’s Day on 8th March with two voluntary nationwide work stoppages of one hour each, to be scheduled for peak work hours during morning and afternoon work shifts. 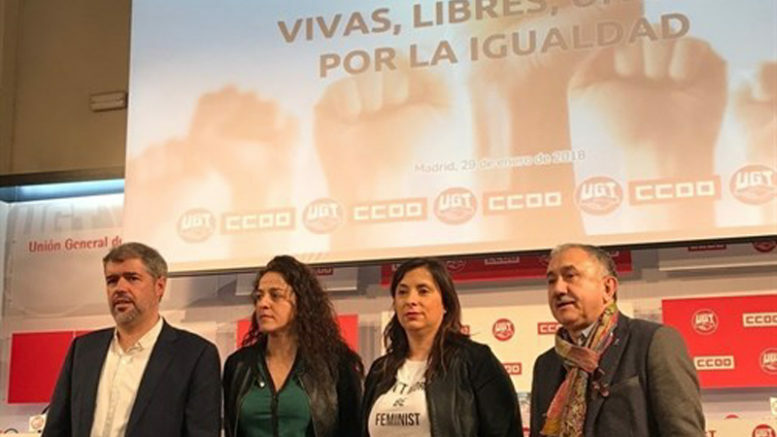 The announcement from leaders of the union federations, which together represent nearly 2 million employees in public- and private-sector workplaces across Spain, said the partial strike action will be official UGT and CCOO work stoppages, convened in solidarity with the 8M Feminist Strike to denounce “the inequality, precariousness and violence suffered by women” throughout Spain. The labour federations, which have long denounced the brecha salarial (“pay gap” in Spanish) that exists for the same work performed by men and women in Spanish industry, retail and service sectors, said that participation by union members in the stoppages will be voluntary. Those union members who choose to participate will lose wages for the time taken off in support of the 8M strike but can face no disciplinary action from employers as a result. Leaders of both organizations said their legal services departments are currently developing the documentation that by law must be presented in Spain in order for strikes and work stoppages to be considered legal and official union actions.